This product was given in exchange for an honest review. No other compensation was provided. All opinions are 100% my own and may differ from yours. I will only endorse companies, products and services that I believe, based on my own experiences, are worthy of endorsement. I’ve said many times that I loved my forties and my fifties are off to a great start, too. I don’t mind getting older at all (it sure beats the alternative), but that doesn’t mean I want to look older, or even my age. I want to defy age! I spend a lot of money on beauty and skin care products. A lot of money. I’m not alone, most women do spend a lot of money on beauty products, especially on anti-aging products. Creams and lotions to reduce wrinkles and make us look younger. The trouble is, most skin care products don’t work. Maybe they would work if we opened pathways for nourishment deep into our skin tissue allowing skin care ingredients to work to their fullest potential. 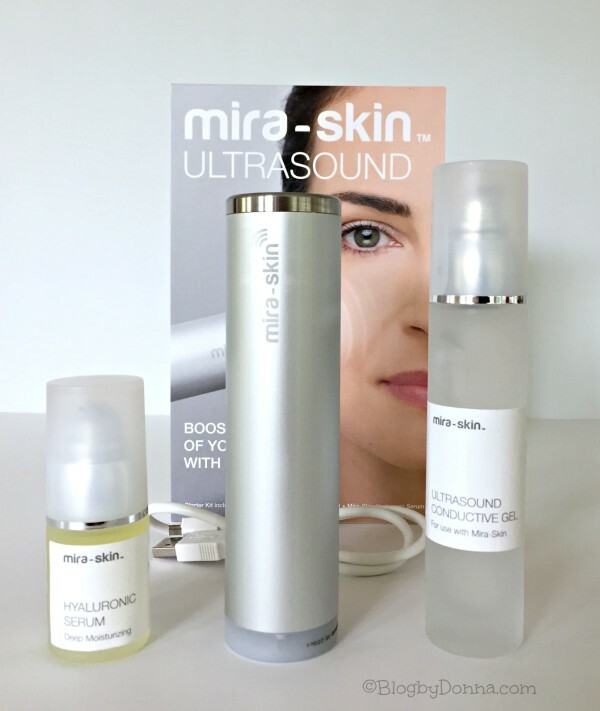 With Mira-Skin Ultrasound, you can do just that… by using a professional cosmetic ultrasound treatment, you can maximize the benefits of your favorite skin care products. See, without ultrasound our skin care products just sit on the top layer of our skin, but with ultrasound, Hyaluron and skin care ingredients can penetrate your skin more deeply. 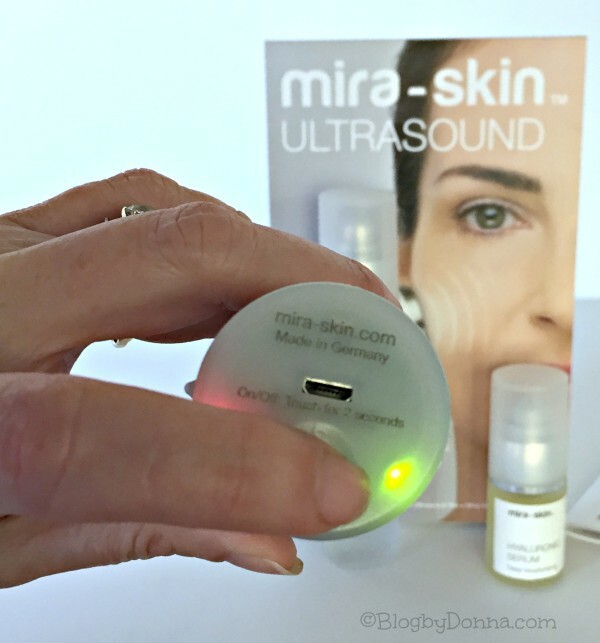 I was thrilled to get the opportunity to try the Mira-Skin Ultrasound starter kit recently. First though, What is Ultrasound? Ultrasound is an oscillating sound pressure wave with a frequency inaudible to the human ear. Ultrasound has a frequency greater than 1 MHz frequency (one million cycles per second). Audible sound has a frequency between 15,000 and 20,000 cycles per second. 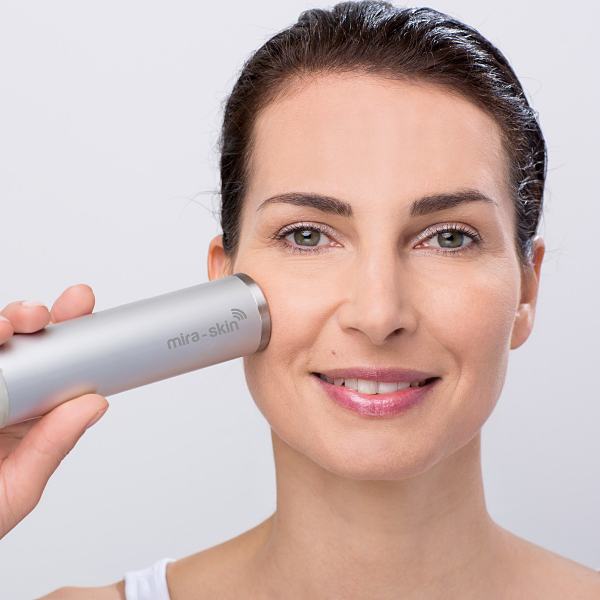 Mira-Skin uses soft ultrasound to add vitamins and nutrients into the skin, which stimulates renewal and hydrates your skin. Soft ultrasound is gentle and harmless. Ultrasound requires a conductive medium. The Mira-Skin Ultrasound conductive gel, which is enriched with additional ingredients and is included with your Mira-Skin. It can also be purchased separately as a refill at www.mira-skin-ultrasound.com. The Hyaluronic Serum and the Ultrasound Gel comes in glass containers to minimize health issues like the chemical BPA. types, even the most sensitive skin types. With Mira-Skin, you can now enjoy luxury spa treatments in the comfort of your home! The Mira-Skin Ultrasound is the anti-wrinkle solution without injections. 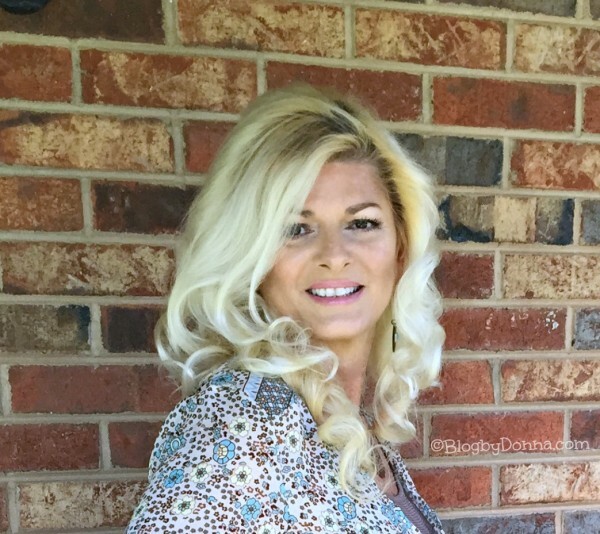 I love the idea of getting firmer skin without invasive procedures. I’ll also save money not having to go every 3-6 months for pricey injections, as well as saving money since my skin care products will last longer since I’ll get more out of them. 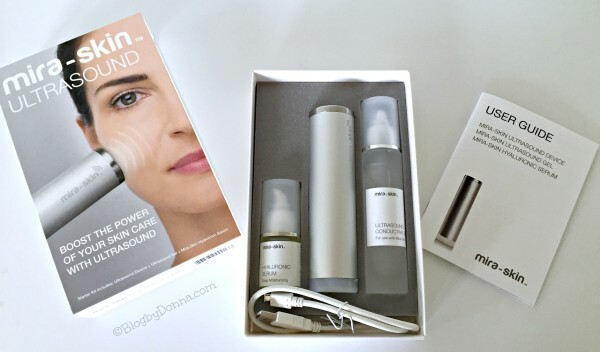 The Mira-Skin starter kit retails for $349.00. 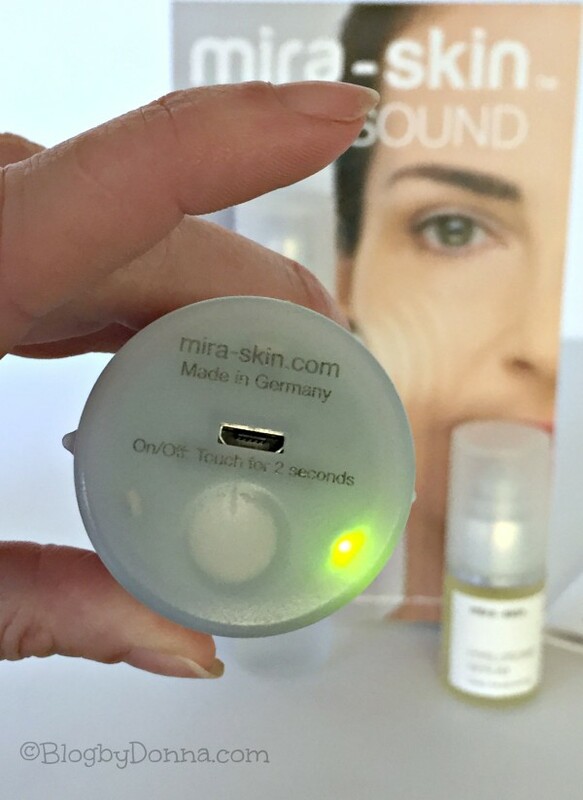 It’s easy to use the mira-skin ultrasound. It comes pre-charged so you can use it immediately, which I did! Then you charge it with the USB cable that comes in the kit. I charged mine before I went to bed and unplugged it the next morning… I’ve used it twice so far since charging it and haven’t had to charge it again. You just touch the bottom of the device for 2 seconds and it turns on for 5 minutes. If you want to do 5 more minutes (never do more than 10 minutes at a session) just touch the bottom again for 2 more seconds. Begin by gliding Mira-Skin across your forehead in circular motions. Next lie up along the lower jaw and toward the cheekbones. Then move the device upwards around the sides of your nose. Finally, glide Mira-Skin down toward the chin. Glide from the bottom of the neck in upward motions. Finally, good the divide down the right and left sides of your throat several inches away from your Adam’s apple. Note: Avoid using the Ultrasound wand on your eyes, ears, and Adam’s apple. Also, never use Mira-Skin more than 3 times a week, they recommend 2-3 times a week and never for longer than 10 minutes at a time. They recommend use it for 5-10 minutes. I’ve only used the Mira-Skin 3 times so far, tonight will make the fourth time, and I can feel a firmness in my skin. I do feel like my face is lifted, for a lack of a better word. I’m noticing a real change on my neck (and that’s one place age really shows and there is little you can do about it). I’m excited to see how my skin looks in 2-3 months of regular use. I’m loving how my makeup goes on smoother and looks better. I will say, it’s nice to have a spa-treatment like Mira-Skin Ultrasound in the comfort of my own home at an affordable price. Thank you for the review of this item, I have never tried anything like this before. You look absolutely radiant! I look young as it is, but want to keep it that way. I love this! I am 56 and need this! I need younger looking skin, I am not happy about getting and looking older, I do not like when they accuse me of being my 12 year old son’s grandpa! That is so cool! I’ve actually never heard of anything like this before, but I’d love to try it. You look beautiful. I’ve never tried something like this at home before. I’ve had things like this used on me at spas…but I always wonder if they’re the same grade as the home versions. You look fab! Wow! This is so revolutionary and super cool! I could use this for myself. It’s so nice to have someone who actually has used something and knows how it works describe the likes and advantages of a product. What a great opportunity to keep skin looking good. This would be really cool to try out. I imagine that this wouldn’t have to replace anything in the beauty routine so it would be a great addition. What a neat product, I would love to share this with my family and friends who would use it! How awesome! I need to take better care of my skin. I want to continue to not look my age. I have never tried anything like this before. I am always looking for new products to try. My skin could really use this. I would love to try this. My skin is starting to show signs of aging. I have never heard of using ultrasound for beauty. This sounds like a step up from the brush cleansers. Wow…never heard of this type of thing before. I always enjoy learning about new things. Learn something new every day! You look stunning! I’ve never heard of this before. I would love to look into it as I’m aging my skin could use some help! I like that it comes with so much. That eliminates the need to buy extra and that’s always a big plus in my book. I have never heard of using ultrasound for skincare, I am a total science nerd and would like to research this some more! I am glad you are finding that it is showing results and that there is a way to test it is working with the water! Wow ultrasound for your face? Sounds like a really cool way to use technology for skin care! This is something I would love to try. Being that it is not too expensive and certainly much less then some of the salon treatments, I just might try it. Thanks for your indepth review. How amazing! I would love to give this a try! This product does look amazing and since I’m about ready to hit the big 4-0 I think I really need this! Thanks for the review! I have been looking for something like this, thanks for the review.